We recently posted about the value of using a Life Cycle Analysis (or LCA) to examine the environmental impacts of a product. However, the Earth can’t be our only concern when we look at the effects of the materials extraction, manufacturing, distribution, usage, and disposal involved in our stuff. There are 7.6 billion people on the planet, and the products we buy can directly or indirectly transform the lives of others who live in our community or halfway around the world. This time around, we’ll use an LCA not just to investigate the environmental footprint of our products, but to make sure we’re not stepping on the rights of other humans. A life cycle analysis, or LCA, is a technique that assesses the impact of a product, from the materials used to make it to its ultimate disposal. While it’s often used to look at the eco-footprint of an item, we’ll take each step in turn and look at its social impact. 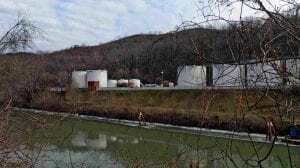 The site of the Elk River, WV mining chemical spill in 2014. The raw materials for a product must be grown, harvested, or extracted before it can exist. One major way we obtain materials is through mining. As we mentioned in our environmental LCA, mining can have devastating impacts on the Earth, especially in biodiverse places. Mining operations can also play a role in local political strife. For many years in the Democratic Republic of the Congo, armed militant groups and warlords owned many of the coltan mines, so purchasing a new cell phone could literally funnel money into the violence. Conditions in the DRC’s mines have improved in the past few years, largely attributed to a US law that required large companies like Apple to divulge the origins of the materials used for their products—a strong argument for consumers lobbying and taking action based on an LCA. Mining can also cause health concerns or crises closer to home; for example, in 2014, the Elk River in West Virginia was contaminated by toxins from a coal processing facility and thousands were unable to use or drink the tap water. In our global society, most manufacturing no longer takes place close to the consumers that ultimately buy a product. In the case of garment factories, for example, many are located in Bangladesh because it has one of the lowest minimum wages for textile workers (despite a recently negotiated increase). However, this is radically changing the social landscape there, as people, often women, move away from the rural towns where they were born to seek employment in cities. The conditions are often dangerous—the Rana Plaza factory collapse killed 1,100 — and pollution and fumes from the dyes can harm the health of those who work in the factories or live nearby. Once it’s made, every product has to get to a consumer who will pay for it. Our environmental LCA post largely focused on shipping and its contributions to greenhouse gas emissions. It’s important to note that the carbon emissions that lead to climate change aren’t purely an environmental concern, but a social one, too. The world’s wealthiest nations are contributing most significantly to climate change, while marginalized people and countries pay the highest social price. In 2017, the UN announced that, largely due to climate-related shocks, the number of chronically malnourished people in the world was growing again after previous decline. The FAO found that child labor was on the rise–again, after a previous decline and again, driven by climate-related disasters and conflict. And on a smaller scale, the growing “gig economy” which may help deliver groceries or other purchases can have negative impacts on workers—they usually lack benefits such as retirement savings and health insurance, protections like workers compensation if injured, and job security. The social impact of a product’s usage can vary widely depending on the item itself. In the case of an average gas-burning car, driving it creates pollution that can exacerbate health problems, especially for those most sensitive, such as children, people with asthma, and the elderly. You may actually be at greater risk inside the car than as a pedestrian, studies have found. Other health concerns for users can arise from packaging or containers used to store food. For example, the scientific community and the FDA are still not in agreement about the potential carcinogenic effects of BPA, a chemical still found in many cans and plastics. 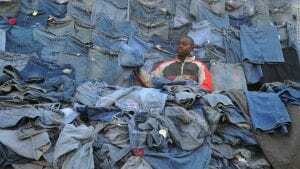 A clothing seller in Kenya resells imported jeans. Sometimes donating our old items gives us a warm, fuzzy feeling. And it’s true that it’s better for the environment than throwing them away outright. However, donated items are not always a welcome or needed addition. For example, the US currently exports over 1 billion pounds of used clothing annually, much of it ending up in Eastern Africa. This has devastated local clothing industries, because people buy these impossibly cheap discarded garments rather than spending money on artisans in their own community. Some countries have banded together to attempt to ban these imports, which they feel are doing more harm than good. It’s important to think twice before sending an item out of your sight—consider whether you could mend it, upcycle it, or give it to a non-profit which operates locally. You can address both the environmental and social impacts of products through an LCA. To do this in a classroom, check out our PopEd lessons: Secret Life of Stuff (middle school) and Secret Life of Tees (from our high school unit on Solid Waste).